Our first stop on our adventure was Auckland, the most populous city in the whole country, which is located on the north half of the North Island. I spent a bit over a week here back in 2005 so I had some familiarity with the layout of the city. 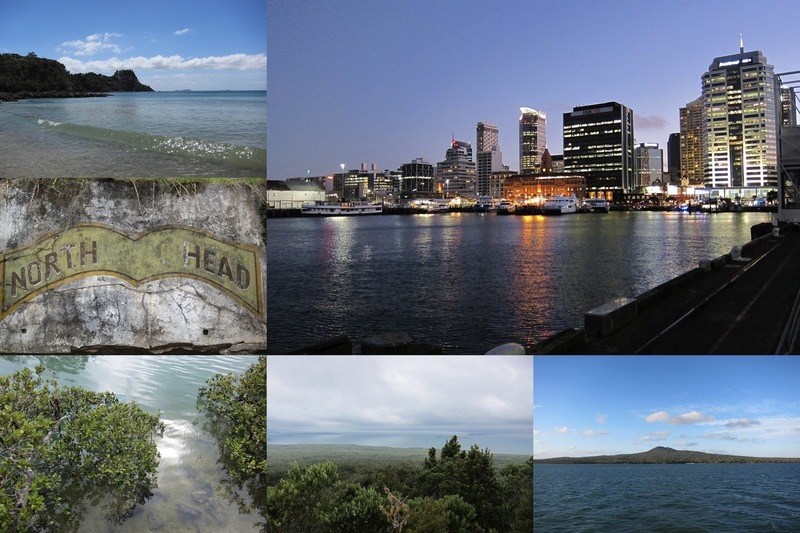 Some of the highlights were our day trips to Devonport to explore the tunnels around North Head, hiking Rangitoto, and cruising around Waiheke Island in a convertible. While we were there, it actually felt a bit tough to get around and find safe gluten free spots to eat, but now that I look at the number of places I've compiled for this post, I don't feel so bad about it anymore. One of the biggest problems that we ran into was that it seems like most restaurants didn't have a website or a way to confirm that they were still in existence. We ended up going on a number of wild goose chases trying to find places to eat. Luckily we did come prepared with snacks and found a couple of grocery stores to pick up rice cakes and peanut butter to get us through the tough times. In the area known as the Central Business District (CBD) or Auckland City we found a couple of quick spots to grab some bites to these. All of these spots are walkable from Queens Street, which is sort of the main drag in the CBD. Very similar to a Chipotle in most ways except that the chips were also gluten free! The food was nothing spectacular, but it was fast and it's open late. The actual location was kind of neat to, it's just at the start of a wharf that you can walk on and it's where we took that picture of the city at night at the top of the post. 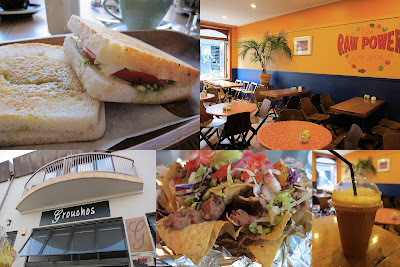 Groucho's was probably one of my favorite finds of the trip for breakfast and lunch type foods. Their menu is labeled with any gluten free options available, including gluten free bread for all of their sandwiches. They also had an excellent coffee and tea selection which was very enjoyable to sip with their retro decor. We ate their twice and I got to enjoy a tomato, pesto, and goat cheese sandwich and some toast with lovely apricot jam. We only stopped here to get some juice, but supposedly there were a couple of gluten free options on their breakfast and lunch menus. The cafe itself had a really nice tropical vibe with lots of indoor plants and being on the second story of a building looking out on a pedestrian only alley way. A bit farther away from the CBD are the neighborhoods of Mt. 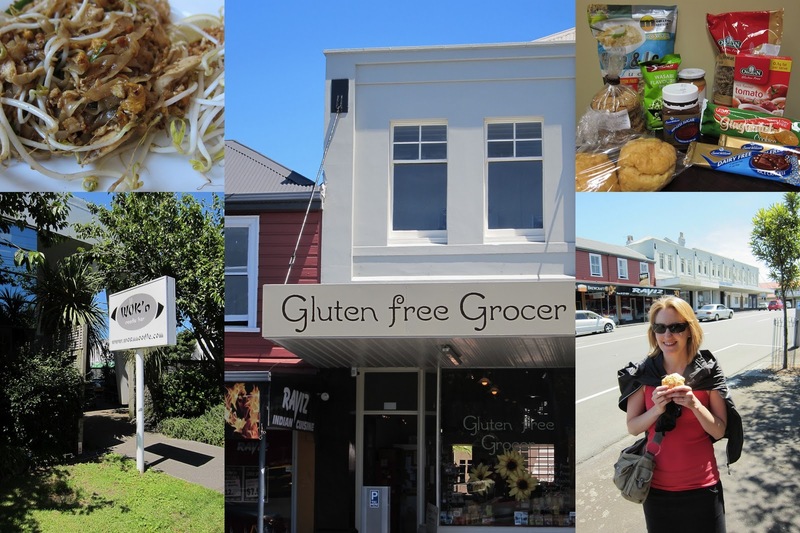 Eden, Eden Terrace, and Grey Lynn. One day we walked to Eden Terrace from our hostel in the CBD and it was doable, but very long. To get there again and to get to Grey Lynn we took the bus. This is was the spot that had me most excited to visit and it really was wonderful. In their wide selection of gluten free goodies, which included gluten free pot stickers and dumplings, we picked up a load of goodies for our travels. The Gluten Free Grocer also sells a variety of house made goodies including cookies, bread, and pizzas. We picked up some jam drop cookies and biscuits, which were very light and almost pastry like. The woman working at shop also gave us some great advice about lunch spots, including the one below. Wok'n Noodle had pretty much the best Pad Thai I've ever eaten, so this was another place we went to twice. Their menu isn't really clearly labeled as to which dishes are or are not gluten free, but their staff was excellent and seemed to know all of the options off the top of their head. I wish we had a Wok'n Noodle in Seattle. From what I could gather this was the oldest and only organic/speciality grocery store in the Auckland area. They had a wonderful selection of gluten free goodies and dairy free goodies as well. Their organic fruit selection was also quite nice and we were able to pick up some stone fruits which were currently in season.